The beginning of 1937 saw the first appearance of the shortwave programme schedule in the Radiojournal weekly. The shortwave broadcasts were still described as experi- mental. The schedule is divided into "European" and "American" bands, but the programmes were commonly referred to as "broadcasts for America" or "broadcasts for Europe." The broadcasts for America were transmitted on Tuesday and Friday from 01:00 to 03:00 on the 25.34 metre wavelength, while the broadcasts for Europe were transmitted every day from 20:25 to 22:30 on 31.41m. 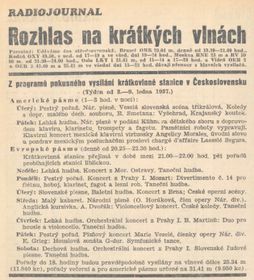 The schedule shows that the transmissions included material from "domestic" Czechoslovak Radio programmes. Interestingly, the schedule includes several other European radio stations broadcasting on shortwave: Brussels, Copenhagen, Moscow, Oslo and Vienna. 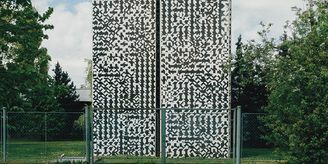 In May 1937 the shortwave transmitter in Podìbrady went from experimental to regular operation. Broadcasts to the Near and Middle East (every day from 13:55 to 16:00) were already underway. Radiojournal Weekly, January 1937 News bulletins formed an important part of the international service. Leafing through the weekly publication Radiojournal, it seems the American programme featured a ten-minute news bulletin. News was read in Czech/Slovak and English. Once a week there was also a bulletin in Ruthenian, and from late 1937 Spanish-speaking listeners could hear the news as well. In the European broadcasts news bulletins lasted five minutes and were read in Czech/Slovak, English, German and French, and sometimes in other languages including Russian, Italian, Flemish and Romanian. The chief language of the spoken-word programmes was Czech, but lectures were also broadcast in English, German and French. Foreign citizens helped contribute to the production and presentation of both the lectures and news bulletins. Bozena Danesova, later Trojanova, began working in the shortwave section in 1937: "I went for an interview for the shortwave broadcasts. Back then it was a little department, just starting up. It had about eight people, three of whom were foreigners. I was taken on to look after the listeners' letters, but I soon began working as an announcer as well. I introduced programmes in German, English, French, Czech, and later in Spanish. I was born in Vienna, so I could speak German, and I learnt the other languages. I broadcast mainly to Asia and the Far East. We asked listeners to write to us and tell us how well they could receive our programmes and what they would like to hear. We received hundreds of letters with various requests. Some listeners would send us photographs of themselves. We answered letters both in writing and in the "Letterbox" programmes. Each announcer was responsible for a letters programme for his or her area of broadcasts. Mine was broadcast on Saturdays; it was called Mailbag." A memorandum from the head of the shortwave broadcasts, Bohuslav Tvrdy, confirms that responding to letters was considered extremely important: "The aim of the letters programmes is to build a close relationship with our foreign listeners, to win their affection for our country. Politics have no place in these programmes. Announce the letters programmes frequently, as soon as you have a moment's airtime. American announcers should also promote the English letters programmes. I want announcers to be creative - the more taste and subtlety, the greater the success!" In 1937 Radio Prague received 14,000 letters. About two-thirds came from English-speaking listeners. The remainder came from all over the world, but mostly from Czech expatriates living in North America. 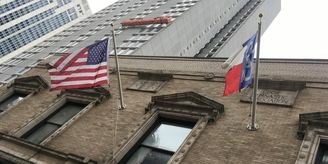 The "Expats Corner" - a feature devoted to Czech expatriates living in the U.S. - also helped. 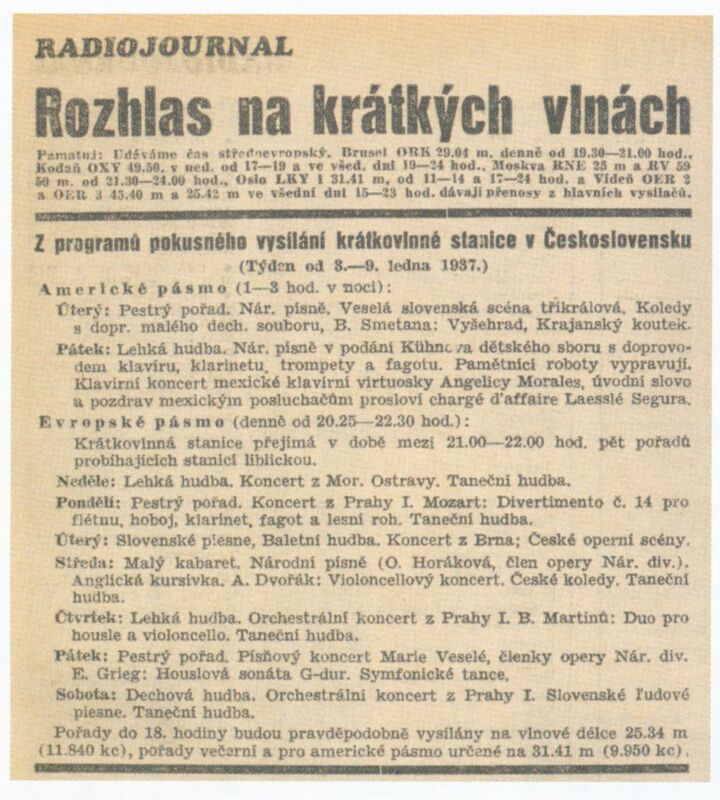 Listeners' competitions were also popular; winners were rewarded with small prizes from Czechoslovak Radio.